Chautauqua Welcome Center — Dembling + Dembling Architects P.C. The Chautauqua Lake Welcome Center is located on the eastbound side of I-86 in Chautauqua County, New York. Located high above the waters of Chautauqua Lake the rest area offers travelers a breathtaking panoramic view of the lake and its’ surrounding region. The scope of the project included the design of a mixed-use rest area facility to support the traveling public, commercial haulers, tourist information, New York Sate Police, NYSDOT Commercial Vehicle Enforcement Unit, (CVEU) vending, and maintenance. The buildings design reflects the regionally prevalent Victorian vernacular, and presents an attractive welcoming building providing the traveling public and commercial trucking industry with a modern, multifunction rest area. Exterior picnic tables and seating walls are strategically placed and integrated into the sites landscaping scheme, which include abundant indigenous plantings. Traditional floral gardens line the main walkways and entrance plaza offering travelers a brightly colored and richly scented welcome to the rest area. 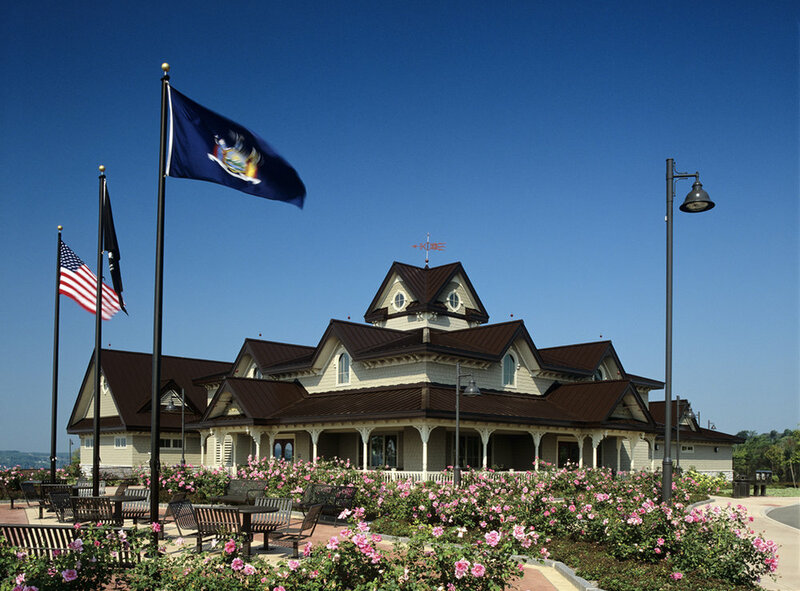 Following the formal Victorian design theme, the wrap-around veranda encourages travelers to relax and enjoy the scenic vistas along Chautauqua Lake. Creating the illusion of a “Victorian Hotel” required the combined use of many natural and manufactured materials such as; standing seam metal roofing, cementitious siding, manufactured stone wainscoting, divided lite windows, decorative floor and wall tile, faux-alabaster pendant and wall sconce light fixtures. The veranda is highlighted with decorative urethane column covers, brackets, dentils, and balustrade system. The 10,200 square-foot facility combines several elements to assist the public and create an inviting rest area. The lobby includes a staffed tourist information center, vending machine area, public telephones and drinking fountains, as well as handicapped accessible dual facility public restrooms, and family assist restroom. The sensible design and carefully integrated circulation control is intuitive and understandable for the first time visitor. Other spaces provided includes NYSDOT truck inspection and maintenance office, NYSP Interstate Highway Patrol and Commercial Vehicle Enforcement offices, which provides a police presence for the safety of the public and the control of commercial truck traffic.